I went on vacation and then spent a week trying to catch up on work. My questions were delayed! I did finish the book during my travels, so I cheated... again. 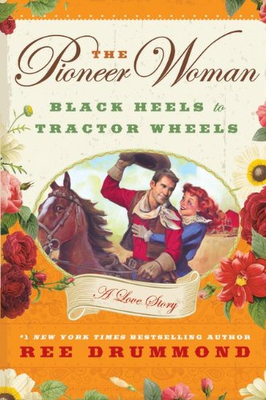 This month we are reading Ree Drummond's The Pioneer Woman: Black Heels to Tractor Wheels. It is a real life love story between a city girl and a cowboy. During a pitstop at home in Oklahoma between Los Angeles and Chicago, Ree meets Marlboro Man and her plans are radically altered. I love The Pioner Woman's site, particularly her recipes, so I was excited to read her book. My mom had read about their courtship on Pioneer Woman and raved about it. It is so very romantic. I am having a hard time not reading ahead (Ed. note: this didn't last very long)! Book club members were asked to submit questions, hence the name before each question. (Rachel) Has this book brought you back to the beginning of a romantic relationship in your life? Her story does not remind me of any specific relationships, but I do remember that general giddyness and giggleyness (just made those words up, feel free to borrow them) that is part of a new relationship. Its quite fun to think about, actually! There are few things better than a great first kiss. (Erin) What surprised you about Ree? If this was your first time reading about her background, did anything surprise you about her "beginnings?" Although I hadn't read the love story on Pioner Woman, my mom had told me enough that I understood their beginnings. I was a little surprised at all the brand name dropping. I am assuming that is to emphasize her big city life. I also didn't realize that she lived in LA for such a long time. Moving from LA to a ranch would be a TOUGH transition. I can't believe she was a vegetarian either. Her recipes are very carnivore friendly! (Nina) While reading Part I of Black Heels, did you find yourself comparing your own love life/story to Ree's? Its natural to do the comparison, and I did relate a bit to giving up "your plan" for the love of your life. My husband and I have more similar backgrounds than Ree and Marlboro Man. Jake grew up a little closer to cornfields than I did and often comments about how he just wants a "piece of land," but we aren't moving to the country any time soon! I do understand the sacrifice of leaving the city as I left my big city to move closer to him. Even though I live in a suburb of Chicago, I miss living downtown. (Nina) Would you have handled ex-boyfriend (J) the same way or differently than Ree did? Its so hard to say without knowing J or being part of those conversations, but I probably would have done the same thing. Its hard to call it quits after 4 years when no one has done anything wrong (i.e. cheating, gambling binges, other nasty behavior). I'm sure that I wouldn't have been confident enough in my decision to just break-off communication in LA. I would hope that I would have ended things in a more official capacity after a few dates with MM. To be honest, I would have called J after that first night in the bar! (Nina) Have you ever made a life-changing decision based on a guy in your life? And how did it work out for you? I'm having a hard time answering this question without getting too personal... there is a lot more that I can say, but I won't! I will say that if Jake and I weren't married, I would probably be living downtown Chicago. I love the little suburb that we live in, but I do miss the city. (Stephanie) How do you think Ree's family felt that she was just going to give up going to Chicago for a guy she had just met? I think they were probably pretty confused! I'm sure her parents and her brother Mike were happy that she was staying so close to home. Her brother in Chicago thought she was making a huge mistake (which he told her) but hopefully once he met MM he felt better about it. Her sister seems very supportive. I'm sure she was happy if Ree was happy. (Rocky Mountain Wife) If you were Ree and started to question your life plan (leaving Cali, moving to Chicago, being independent for a while)...how would you feel when this sudden romance came into your life at the 'wrong' time? I would think that I would question my motives. MM was kind of a rebound from J. There was a bit of time between Ree meeting Marlboro Man and their first date, so she had time to think about what dating him would mean. They spent so much time together. They must have known each other pretty well. I think it would be so hard to have decided against shaping my life around one man only to (even more dramatically) do the same for another. Their love seems so very romantic, like new love. I wonder how true to life that was! It definitely affected her. It made her question all the happy moments of her childhood and I'm sure it shook up her image of an ideal marriage. It seems like she didn't let it hurt her relationship with Marlboro Man, perhaps it made it stronger. (Meredith) I love all the details of Ree's cooking for Marlboro Man in the early stages of their relationship. Have you ever made anything for the guy in your life that was just an utter disaster? Did he choke it down anyway? I am my harshest critic when it comes to cooking and baking! There are things that I have made that we both choked down due to the amount of time or money that I spent making the dish. Lately it has been overcooked chicken or noodles- having a toddler makes you forget about what is on the stove! I don't think I was brave enough to cook during the early stages of our relationship. (Amber) How much of Ree's book do you think is truth or fiction? How much did she embellish? Do you think she omitted or added anything? Obviously she couldn't get EVERYTHING that happened during this period of her life in the book, but I kept wondering what was left out and if some of the stuff she was writing was built up just a teensy tiny bit. I kept thinking that she was writing the book with her children in mind. They would read it someday and I'm sure they wouldn't want to hear about mom and dad getting hot and heavy in the back of the pick-up truck or their messy arguments. She used a lot of "flowery words" (the dreaded critique from my high school English teacher) in describing their make-out sessions and I'm sure that she was leaving stuff out! I don't really think she was embellishing their love... I think they had a really long honeymoon period. I can't believe that they only fought once between meeting and marriage. I can see MM being a calming influence and not one to argue, but Ree seems like a firecracker. I could see her picking a few unnecessary fights!